Writer Bruce Olav Solheim joins me today and we’re chatting about his memoir, Timeless: A Paranormal Personal History. Bruce Olav Solheim was born on September 3, 1958, in Seattle, Washington, to hard-working Norwegian immi­grant parents, Asbjørn and Olaug Solheim. Bruce was the first per­son in his family to go to college. He served for six years in the US Army as a jail guard and later as a hel­icopter pilot. He earned his PhD in history from Bowling Green State University in 1993. 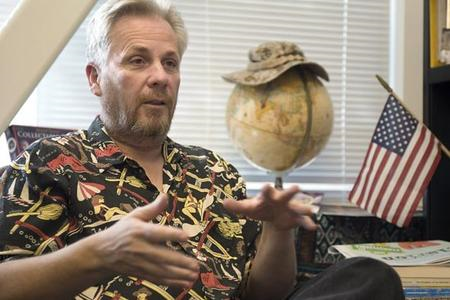 Bruce founded the Veterans Program at Citrus College and cofounded, with Manuel Martinez and Ginger De Villa-Rose, the Boots to Books transition course—the first college course in the United States designed specifically for recently returned veterans. He has published eight books and has written ten plays, two of which have been produced. Professional academic people are afraid of destroying their reputations and careers by even considering that there is such a thing as the paranormal or psi, much less writing about the phenomena from a personal perspective. I hold a doctoral degree and have waited until my retirement is imminent to write this book. Timeless: A Paranormal Personal History, documents 34 incidents of paranormal events in my life: telepathy, telekinesis, ghosts, demons, guardian angels, precognition, near-death experiences, and more. 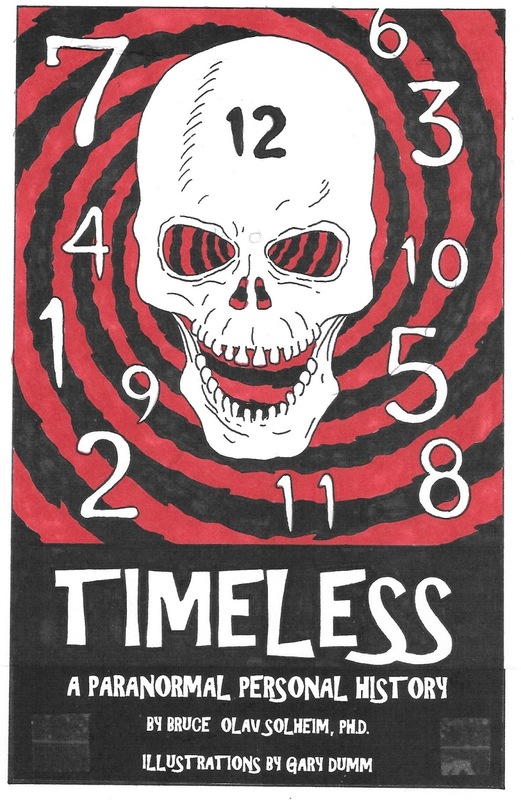 Timeless also includes 23 illustrations by comic book artist Gary Dumm of American Splendor fame. As I say in the beginning of the book: “It’s not that I believe in ghosts, it’s that they believe in me, so I’ve no choice.” In one of the many visions I have had, I connected with a primordial mystic who may or may not be of alien origin. The book reveals his important message to me. Timeless offers a message of encouragement for others to share their stories of the paranormal and to be assured that there is a life beyond this one and that we are, indeed, timeless. I have had paranormal experiences since I was four years old. My mother was a psychic of sorts. Now is the time to tell the stories. I’ve thought about this near-death experience over the years and wonder if sometimes different paths in our lives run simultaneously. In other words, maybe there is one version where I died and another version where I lived. Maybe these forks in the road of time happen every once in a while, and therefore we never really die we just continue living on another path ad infinitum. Eventually, after we experience many such forks, we finally reach old age and die, but only temporarily. Maybe we then return anew to start another life—reincarnated. It’s just a theory; I’ve no proof, just a hunch. Perhaps there is no death, and perhaps death is the greatest deception of all. The sequel to Timeless, Timeless Déjà Vu. I started writing when I was 7 years old. I put together a book of my stories and drew pictures to go along with it. I am still doing that 52 years later. Words and pictures. I teach history, but I write every day, a few hours, some days more. Weekends, I write a lot. I think of writing like John Lennon thought of music, it is a life raft. I like to capture butterflies as one of my teachers (Jose Cruz Gonzalez) said. I immediately capture an idea in a notebook, scrap of paper, text to myself on my phone, any time, day or night. I have to be ready at all times. I even write texts to myself when I am going to the bathroom. A baseball player, an astronaut, a bulldozer driver, a writer. Hopefully all of them. Thanks for being here today, Bruce.